Team members Dylan Cameron, Matisse Kirakosian, Sam Martin, Lessa Darby, dog Gary and Jamie Christian at Darby's Paint. Whether its cars, motorbikes, boats, trailers or trucks, Darby’s Paints offers professional products to repair or restore clients’ pride and joy. From minor scratches to paint work through to full restorations, DIY and automotive enthusiasts can be assured that the qualified and expert team at Darby’s can help. Darby’s Paints deal with the professionals in panel shops and engineering manufacturers state-wide on a daily basis. Sales manager Anthony Spanninga says Darby’s Paints three stores service hundreds of panel shops right across Victoria, ensuring they are up-to-date with the latest and best products. “We know what the pros prefer and we can offer the same expert advice to everyone,” he says. Among the leading brands supplied by Darby’s Paints is Glasurit, the ultimate premium paint product. Darby’s also supplies easy to use inexpensive quality product Baslac, commercial transport solution CTS, and Glasurit 68 line for industrial, commercial and agricultural uses. Also a direct importer of HB Body, Darby’s provides cost-effective DIY and professional products. With DNA ‘genetically-modified paints’ in shadow and virtual chromes, mutant crystals and easy to apply basecoat candies, specialty painting jobs are easily accomplished with the range at Darby’s. “There’s also our extensive range of paint protection products, cleaners, waxes and polishing products to keep your vehicle at its best,” Anthony says. 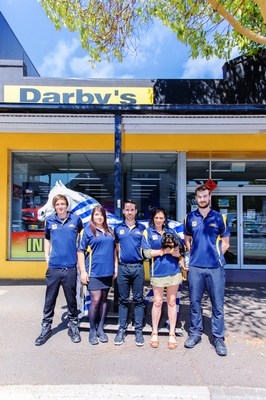 Servicing Geelong for more than 33 years, Darby’s Paints is locally owned and operated. The team takes pride in providing a quality service, using its knowledge and experience to help clients choose the right products to get their vehicles looking brand-new again, says manager Sam Martin. Darby’s Paints is at 413 Moorabool St, Geelong, opposite Kardinia Park, with ‘Chester’ out front. For more information phone 5229 3884.